Home Digital Marketing Having Trouble Connecting With Your Customers? Rethink Your Hiring Practices. Picture a room full of salespeople. What do you see? We’re guessing people like Jordan Belfort, Gordon Gekko, or Glengarry Glen Ross-types — some typical wolves of Wall Street. Phones are ringing off the hook, and reps are chatting about the latest deal they closed — you might even picture a Nerf Ball whizzing by. For years, sales reps have been depicted as ultra-competitive and charismatic workers — leading many to believe that only a certain type of person is suited for the role. But that’s far from the truth. We’ve talked about the stereotypical salesperson and how to coach non-traditional personas to complement your team. Alongside coaching, we’re focusing on hiring and how employing the same kind of person limits your team, dissuades your prospects, and hurts your business. Simply put, your sales team needs to be more diverse if you want your team to grow better. Sales as an organized profession has been around for over a century, but reps’ roles and influence have transformed over the years. 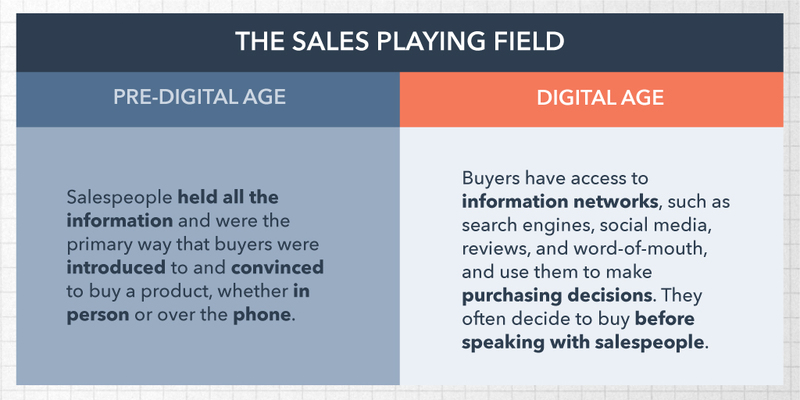 Before the Digital Age, salespeople held the power. Without many ways for buyers to independently learn about products and services, they had no choice but to get on the phone with a company and learn their options. Reps were gatekeepers to information and controlled the buying process. They informed, advertised, and sold to people at different stages in the buyer’s journey, some who might never have thought to make a purchase in the first place. The internet changed everything. Thanks to search and social, the way consumers shop and buy has evolved. Now, buyers hold the power. Consumers look to Amazon for reviews, social media for information, and their social circles for advice. They no longer need salespeople to convince them to buy — they need a consultant who will listen to their wants and needs. The buying process isn’t the only thing that’s changed — buyers have too. Millennials are now the largest generation in the U.S. workforce, constituting nearly half of all buyers.They are the most racially and ethnically diverse consumers in U.S. history and more openly identify as LGBTQ+ than at any other point in history. Gen Z is even more so. Add to that Baby Boomers and Gen X and the fact that sales teams today interact with a variety of consumers worldwide — the buyer spectrum is wider than ever. These consumers want to talk to someone who understands them. Someone they trust. This is difficult when salespeople don’t reflect or understand their prospects. 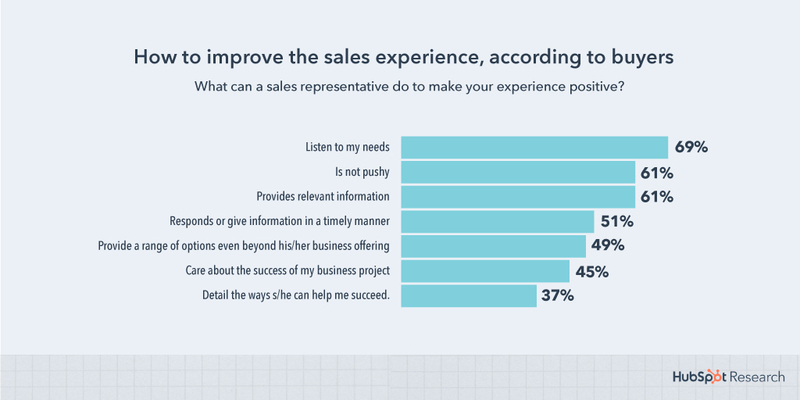 Only 5% of prospects consider salespeople to be trustworthy and many buyers find it difficult to form a personal connection with reps. To succeed, sales teams need to make active listening and building trust their top priorities. If buyers don’t feel acknowledged, they won’t buy. A few years ago, the HubSpot sales team started to examine our own hiring practices and think about the type of company we wanted to be. We were doing okay as a company. But we wanted to be more than okay — we wanted to be great. I was hired in the summer of 2017 to help increase our sales team’s D&I efforts. While HubSpot had started to talk more about the importance of D&I in the workplace, the sales team needed a little help in joining that conversation – they were having a difficult time changing their culture from within. This challenge gave me the opportunity to create D&I trainings, content, and programming targeted explicitly at salespeople. Since I’ve started, I’ve implemented new hire and global sales team training focused on creating an inclusive sales culture. Our team encourages sales managers to lead discussions around specific D&I themes and share their thoughts externally. And we have regular programming designed to bring a wide range of sales folks together to enhance collaboration and internal networking. We’ve also focused on bringing more diverse voices into our sales team. According to HubSpot’s 2019 Diversity Report, from 2018 to 2019, the number of women on our global sales team increased 4%, and the proportion of our new sales hires who identify as a non-white minority increased from 11% to 22%. We still have work to do to see the numbers we’d like, but we’re committed to creating a more diverse and inclusive sales organization. Through our work, our sales team is learning that everyone carries different privileges, we all face different struggles, and that a little bit of patience and understanding goes a long way. Not only does D&I training build empathy among teammates, but it also helps reps connect with customers from different backgrounds. D&I leads to higher morale, better team environments, less turnover, and ultimately, more innovation. According to McKinsey’s Delivering through Diversity study, companies that exhibit ethnic and cultural diversity are 35% more likely to outperform their peers on profitability, while companies with gender diversity are 15% more likely to do so. And diversity goes beyond ethnocultural and gender identities. Those who have served in the military, identify as LGBTQ+, have more work experience, and those with different personality profiles — like introverts, analysts, and reps with different selling styles — contribute valuable insights that do more than increase profits: They transform sales teams. Companies that prioritize diversity are simply smarter. While homogenous teams are quicker to reach decisions, balanced teams are more likely to reach the right decision. By disrupting the comfort of conformity — forcing people to consider outside, nuanced perspectives — balanced teams focus on the facts and check each other’s biases to remain objective. Diverse teams are better listeners — they intuitively understand different cultural landscapes and frictions points because they’ve been exposed to various thoughts and perspectives. And listening is essential because salespeople who actively listen to their prospects’ unique issues are better able to solve them, improving the sales experience. Today’s buyers are looking for more than a source of information on product features or cookie-cutter solutions. They’re seeking a connection built on genuine, mutual trust. Buyers need to believe that we’re genuinely in it to solve their problems, and that we have the level of knowledge needed to craft a working solution for their particular use case and/or industry. The strongest teams create an environment where each salesperson is able to find their own authentic voice. Demographic diversity is the first step of this process — building a balanced team means no one person is the “diverse member” of the team. It means your team can bring their authentic selves to work, instead of feeling like they have to code-switch to fit into a homogeneous group. This freedom not only creates a better working environment — it makes your team more effective. Katie Ng-Mak, VP of Global Partner Strategy and Operations at HubSpot, has built one of our most diverse sales teams. But if you ask her how she did it, she’ll tell you that she’s looking for far more than diversity on paper. Katie seeks to hire teams that are not only demographically balanced, but include a mix of skill sets and personality profiles as well. Teams that celebrate a wide variety of diversity are more effective. This blending of different ideas, personalities, and backgrounds makes these teams more collaborative, creative, and comfortable, allowing them to connect their prospects and understand their problems and needs. Who wouldn’t want a sales team like that? D&I isn’t something to check off a list once you’ve achieved a headcount — it’s a constant commitment that requires attention, strategy, and prioritization. Like you, we know that we have a lot of room to improve. To do so, D&I is integrated into every level of our sales hiring process. It’s easy to recognize the success of that one salesperson and think, “I’d love five more like them.” It’s also easy to only pursue your coworkers’ referrals or hire the candidate you’d like to hang out with. Hiring with this mindset doesn’t produce diverse sales teams because you’re networking in limited circles and hiring based on “culture fit” — a vague term that generally means someone who is similar to your existing team. 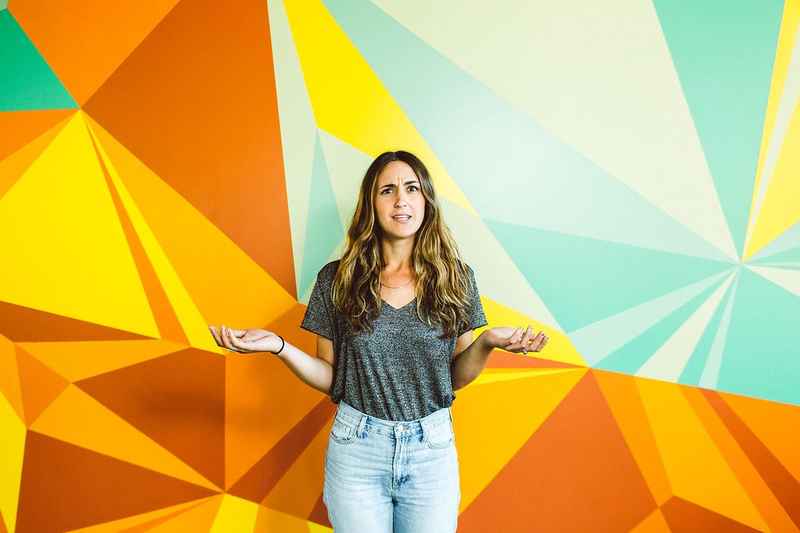 You’re not searching for talent that adds to your culture, only different variations of the same rep.
We’ve had to be super thoughtful about how we’re recruiting and attracting candidates, how to include people that don’t fit into the typical salesperson mold, what our hiring process looks like, and being mindful of different personality types. As sales reps at HubSpot have historically been white and male, we’re cognizant of recruitment sources. We look beyond employee referrals, LinkedIn, and the same universities to gather a diverse slate of candidates. When writing job listings, be mindful of your descriptions, which can skew masculine or feminine and perpetuate gender inequality in hiring. 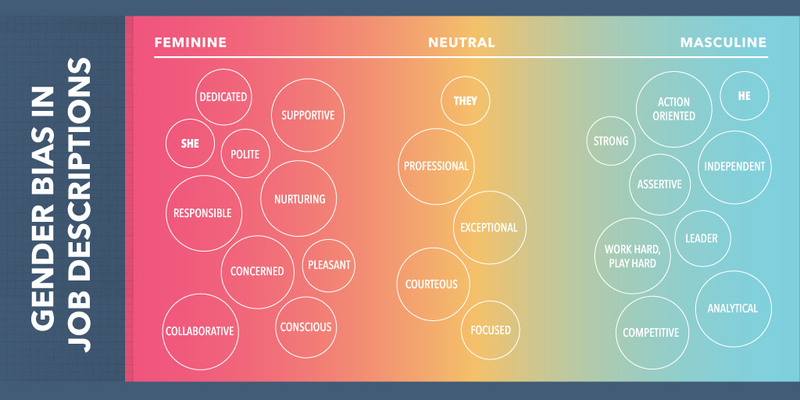 Phrases like “action-oriented” or “nurturing” may be perceived as masculine or feminine, respectively. Rewrite job pages to balance gendered and active language, and write in a neutral tone for the broadest set of applicants. Augmented writing platforms like Textio can offer an objective edit. Before interviewing, define your team’s technical bar: the skill level you hire against. This won’t limit your candidates — it ensures that you’re focused on skills, rather than backgrounds, personalities, or culture. For the sales candidates that meet our requirements and enter the hiring funnel, we create an equitable playing field by putting a few guardrails in place. We train our managers to interview inclusively and work to standardize the interview process. Our recruiters and hiring managers collaborate to craft a comprehensive interview experience. Varied interview styles and questions can inspire candidate feedback based on an unmeasurable, inconsistent scale, so we outlinequestions to standardize interviews and encourage our interviewers to stay on topic. Try creating an interview toolkit ahead of time to keep your team on track. Candidates should feel comfortable asking questions about your company’s work culture. Be sure to leave time during and after the interview to get feedback and answer questions. We’ve seen more and more candidates asking about what we’re doing for D&I as a company, so we provide them withresources about our programming and initiatives and offer them the chance to speak with a member from one of our many employee resource groups during the interview process. That being said, only hiring athletes — individuals who can learn a playbook and manage a tight, repeatable sales process — reinforces a one-size-fits-all approach. While any company-wide sales methodology must be replicable to some extent, a learning mindset is just as important as the ability to be persistent and repeat a process. Today’s buyers can access more product information independently and expect more from the salespeople they work with, so the ability to quickly self-educate on a wide variety of topics is essential. Ask the candidate to share something they’ve learned in the last six months, and walk through the steps they took to do so. Listen for whether they approached the challenge in a methodical way or took ownership of the process. Send homework before or after the interview and ask the candidate to explain their process (and results) back to the interviewer. Again, pay attention to the process and of course, the quality of the work. Ask a curveball question during the interview. Pay attention to how the candidate responds — do they ask additional follow-up questions to gather context so they can deliver a good answer, or do they jump right in without additional information? D&I doesn’t stop with hiring. Inclusion extends well into your sales culture. We build in D&I training from the start to create a welcoming, non-competitive workspace. We also offer “Be an Upstander, Not a Bystander” training for our global sales team. This awareness training takes a closer look at what exclusion and inclusion looks like in the workplace, how to identify privilege, and helps salespeople understand how they can leverage their position to call out inappropriate behavior while staying true to themselves and within their comfort level. Most importantly, it helps to set a solid foundation as we work to create more welcoming and inclusive environments for all. So far, I’ve trained over 350 salespeople and continue to offer regular sessions. HubSpot also provides managers with resources on everyday actions they can take to foster an inclusive work environment, including articles, questions, and prompts for monthly team discussions. We also send out prompts and provide LinkedIn workshops so sales leaders can share what they’ve learned with their external networks. Looking to get your team even more involved? Create employee resource groups and host events where diverse team members can connect. At HubSpot, we host fireside chats with sales leaders. We’re also starting to offer peer-to-peer learning groups for managers and people of color lunch and learns. We kicked off Women in Sales 2.0 — a series of programming dedicated to helping women in sales achieve. Our goal is to create a community where women can feel comfortable building and fostering relationships, networking, and finding mentors right from the start. Whether you set up a small lunch and learn or a large external event, encourage both new and experienced reps to participate in your D&I efforts. To keep on improving, map out your D&I progress and where you fall short across your team, not just your entire company. When tracking your initiatives, ask: Are certain groups feeling differently? Where can you identify gaps in your D&I hiring and programming? Is everyone’s voice being included? Focusing on D&I should be a high priority for any sales leader. Building inclusive and diverse teams will lead your company to not only grow bigger, but you’ll grow better. You’ve built up your sales team with a wide variety of voices and perspectives to represent your customer base. Before you can build relationships with prospects, you need to know how to build trust — and tech can help you. Next week, we’ll be covering how to use tech to compliment your sales methodologies and enhance your customer relationships.